Loews Hotels & Co. has unveiled plans for a $150 million luxury hotel that will be developed in partnership with Major League Baseball's Texas Rangers. The 302-room flagship Live! by Loews hotel will be part of Arlington, Texas' Texas Live! entertainment destination and is slated for a 2019 opening. Spanning 14 stories, the glass tower will feature floor-to-ceiling windows and a slew of exciting amenities, including a 60-foot wide Tower Terrace overlooking an Event Lawn, an outdoor infinity-edge pool and a rooftop terrace for private events, as well as a two-story, 35,000-square-foot Grand Event Center for meetings and conventions. The latter will offer sweeping views of the entertainment district, a grand ballroom with seating for up to 1,500 people and a 1,500-square-foot terrace overlooking nearby Johnson Creek. Live! by Loews Arlington, Texas will also boast more than two dozen suites, a coffee bar, a signature restaurant and a fitness facility, along with a brewery, bar and tasting room operated by Texas' own Revolver Brewing. The hotel will be located between the Rangers' Globe Life Park and the Dallas Cowboys' AT&T Stadium. "An upscale hotel in the Entertainment District has long been a dream for Arlington and we couldn't be more excited to see that dream become a reality with the addition of a Loews branded hotel," said Arlington Mayor Jeff Williams in a statement. "With this announcement, we have just combined three world-class businesses with a world-class destination. This is a home run for Arlington and its residents and visitors." In his own statement, Loews Hotels & Co. chairman and CEO Jonathan Tisch said the hotel is planned to be "the first of several new hotels under the Live! by Loews partner brand." According to local tourism officials, the new hotel can't open soon enough as Arlington is in dire need of more rooms to keep up with its busy schedule of events. "We need hotels. 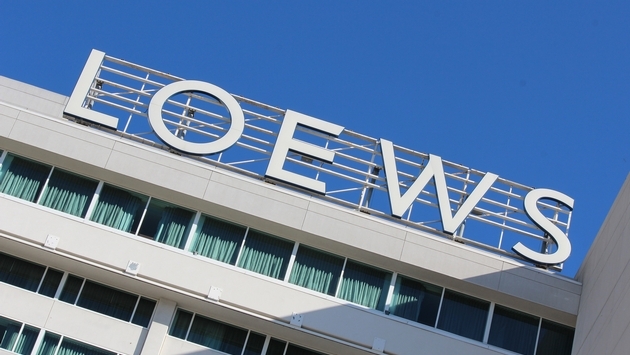 Loews is an incredible brand. This will be something very unique, not just for Arlington but for the surrounding area," Arlington Convention and Visitors Bureau president and CEO Ronnie Price told the Star-Telegram. "They are extremely nice hotels and attract visitors and clientele that Arlington is looking for." The $250 million Texas Live! complex is expected to create more than 3,000 jobs in Arlington and surrounding Tarrant County, including 1,025 permanent positions. It's being developed in partnership between The Cordish Companies, the Texas Rangers and the City of Arlington and is part of a larger $4 billion vision for the Arlington Entertainment District that will include the Rangers' new $1 billion ballpark. The Live! complex is scheduled to open in April 2018 in time for next year's baseball season.